Is your infrastructure ready for the future of IT? IT professionals have traditionally designed and built virtual computing environments from the floor up – now the process is rapidly changing. When it comes to purchasing infrastructure to support virtual and private cloud computing environments, the do-it-yourself (DIY) model is becoming a thing of the past. 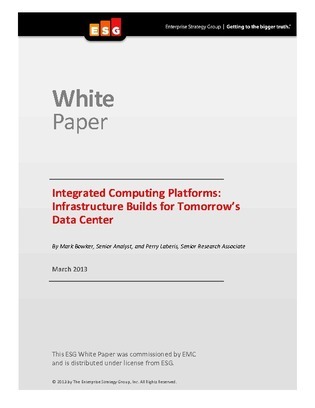 Instead, the new IT consumption model is moving toward integrated computing platforms (ICPs). In this white paper, you will gain insight into increasingly dynamic environments that require infrastructure integration that demands a high level of expertise – relinquishing IT professionals from their DIY mentality to implementing ICPs for optimal efficiency. Read now to learn more.